Save hours when canning! Improved design with larger hopper and dual mounting system. Separates strained juice and pulp from the skin and seeds. Click here to read Galen Lehman's personal recommendation of this food mill! Advanced, yet simple-You won't believe it until you try it. 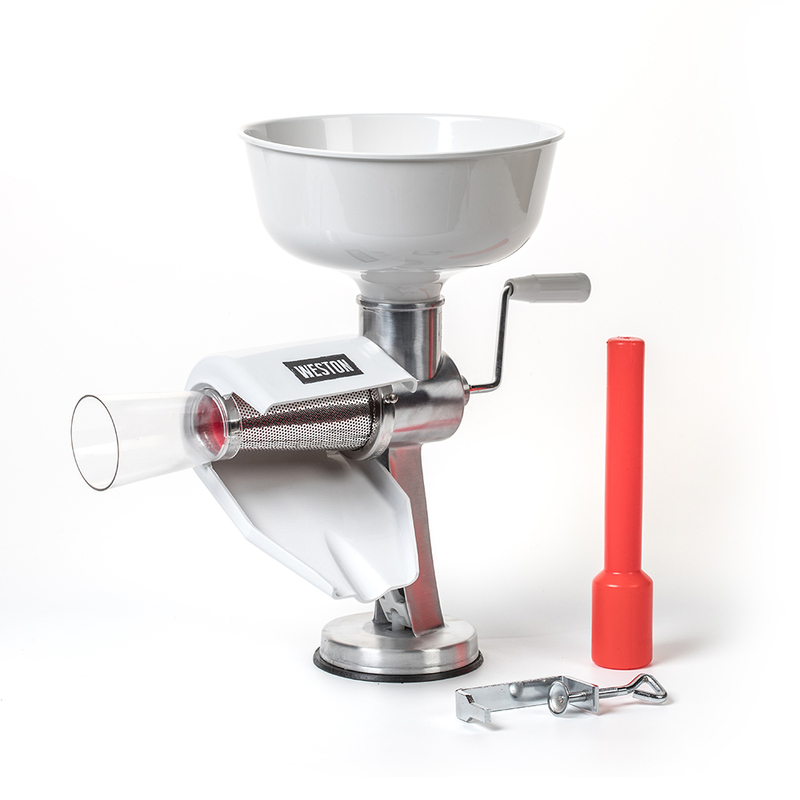 Just drop any soft fruit or vegetable into hopper and turn the crank. (Hard foods like apples need to be steamed until soft.) The Roma Food Mill separates the strained juice and pulp from the skin and seeds. Make tomato/vegetable juice, applesauce, mashed potatoes, refried beans and baby food with standard screen/auger. Process grapes, berries, pumpkins, squash or salsa with optional accessories. How it works-As the auger turns, it draws fruit into a screened cone where it squeezes out the juice and pulp. Thoroughly wrings out the skin, then automatically expels it with the seeds. No peeling or coring-Unlike common food mills, the Roma completely removes skin and seeds from juice and pulp. Continuously discharges waste through a separate opening so you don't need to stop to empty strainer. I like this very much!! I like to make fruit butter after canning the juice with my steamer juicer. It works very well to separate the peelings and waste from the pulp. I recommend it. I regularly make applesauce with the Weston Food Mill. You don't need to core or peel the apples. I quarter the apples, cook until soft and run them through the mill. The applesauce drains down the chute while the peelings and seeds exit out of the waist funnel. Wonder, fun and clean-up is a breeze! 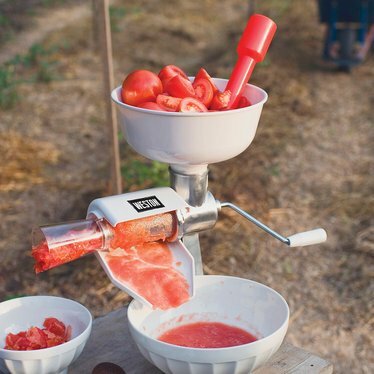 This tomato press does do a good job of separating skins and seeds from the pulp. That's the only good thing I can say about it. It is very difficult to assemble (and disassemble) and the instructions were clearly written by someone who doesn't speak English well, plus the diagrams don't make sense with the written instructions. It might be worth the effort if you are processing huge quantities of raw tomatoes, but I never do that. The promotional materials talk about time savings from being able to put large quantities of fruit or vegetables into the hopper. However, I like to cook my tomatoes before straining and the instructions say you have to let them cool before putting them through this press (presumably because the plastic parts can't handle high heat) which negates any time savings from being able to process large quantities. The suction cup and clamp together would barely hold the press still on my smooth, clean counter - another annoyance. I also found that much of the tomato pulp ended up stuck to the outside of the screen and I had to scrape it off. Finally, it was difficult to clean and awkward to get really dry. I am so dissatisfied that I will be returning this item to Lehman's - a first for me. And I will go back to using my trusty Foley food mill (also sold by Lehman's) for pureeing tomatoes, apples, and all sorts of other cooked foods. I can always use a sieve if any seeds make it through the holes in the food mill, and I will still have fewer things to wash than I did with the tomato press!